Leslie Griffin, Heal the Bay’s chief water quality scientist and Beach Report Card manager, likes to kiss and tell. 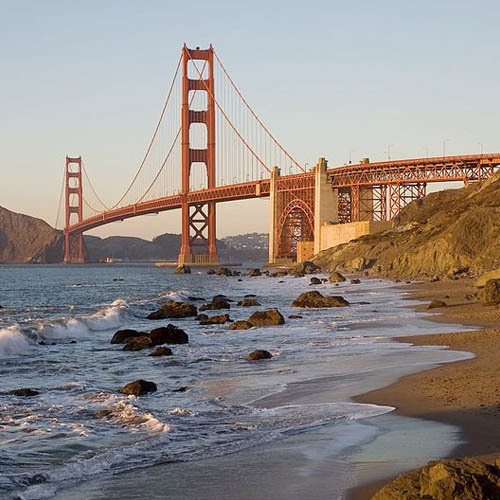 Here’s her list of the cuddliest spots for couples along the California shoreline. Wanna enjoy a long walk on the beach? I know it sounds like a line, but this lovers’ activity is a cliché for a reason. A seaside stroll proves both calming and romantic, with the vast ocean rippling along the shore while your toes sink into the cool sand. Or maybe your dream beach date consists of gazing at a gorgeous sunset while you enjoy a seaside picnic. Either way, we are all about getting a little sandy, whether with a loved one, a friend, or for a little solo escape into the outdoors for some dedicated me time. What we love about it: Torrey Pines State Beach has picturesque views of the San Diego coastline and the adjacent Torrey Pines State Reserve is filled with little trails leading down to the shore. We recommend that you only take marked trails and watch your footing, but the views are worth the adventure. What to do here: We love the Torrey Pines Trail to Black’s Beach in the morning for a beautiful way to start your day. Fair warning: some nudists like to visit this beach as well. Water Quality: The only sampling site at Torrey Pines is at the Los Penasquitos Lagoon outlet. That site received good grades in our most recent annual Beach Report Card. What we love about it: This spot is great for lovers and families alike, with plenty of adventure to be had by all ages. What to do here: This is the perfect spot for a SUP (stand up paddleboard) adventure, snorkeling, kayaking, or even just a picturesque walk along the beach. For stunning ocean views over dinner, check out the Marine Room at the La Jolla Beach and Tennis Club. 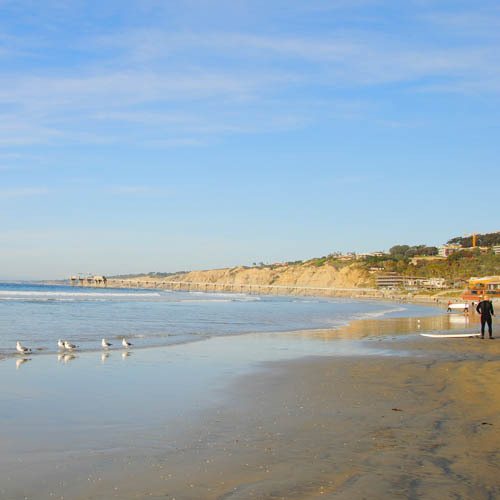 Water Quality: La Jolla shores received great grades in our annual report last year. 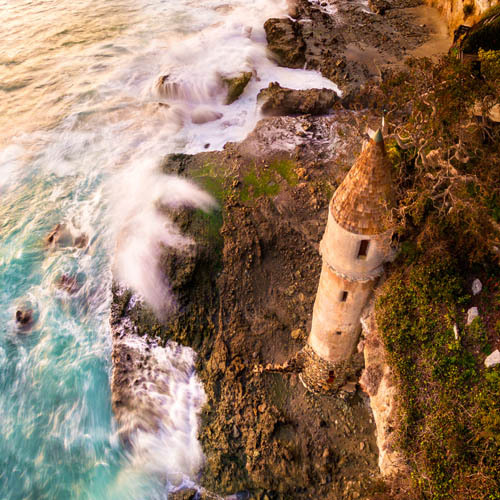 What we love about it: Straight out of a fairy tale, this shoreline spot is guarded by La Tour, a 60-foot castle-inspired tower. Built in 1926, the structure provided beach access for a home on the cliff above. Water Quality: Victoria Beach received A+’s across the board in our last annual report. What we love about it: With such a long swath of open sandy shores, this is an ideal spot for a romantic seaside stroll, or perhaps for a love-inspired photoshoot. What to do here: If you’re looking for post-beach walk eats with an ocean view, the Beachcomber Café is a fun option. Water Quality: Crystal Cove has great water quality in the summer or whenever the weather has been dry. Given the buckets of rain we have (thankfully) gotten this year, make sure to heed any beach posting signs you may see. What we love about it: We love the PV areas so much, we had to lump the whole peninsula together as one of our top locations. 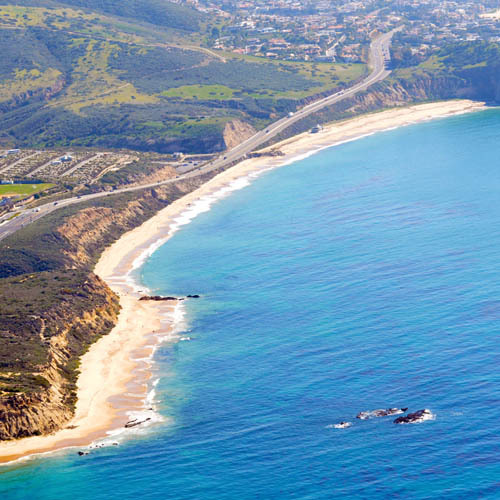 Palos Verdes wraps around from the base of the South Bay down to San Pedro, and features beautiful neighborhoods, coastal trails, clean beaches, and tidepool adventures. 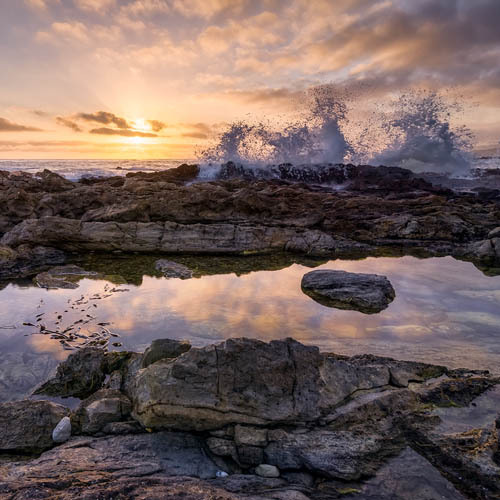 What to do here: If you’re looking for some marine biology-inspired adventure, time your visit for low tide to go tidepooling at Abalone Cove. For a short hike and a hidden rocky beach, check out Palos Verdes Bluff Cove. Water Quality: The Palos Verdes area is home to multiple Honor Roll beaches, including Abalone Cove Shoreline Park. What we love about it: This was easily the top rated romantic spot by Heal the Bay staff. Dramatic cliffs and coves (and even secret sea caves) make this beach feel like the backdrop of a steamy Hollywood romance scene. Whether it’s energizing a new flame or a longtime squeeze, you can expect El Matador to light your fire. What to do here: Explore the dramatic landscape, take Instagram-worthy photos, find little hideaway spots for you and your date to share secret kisses, and wrap up your evening with a gorgeous sunset view. Water Quality: El Matador is an Honor Roll beach with awesome water quality. 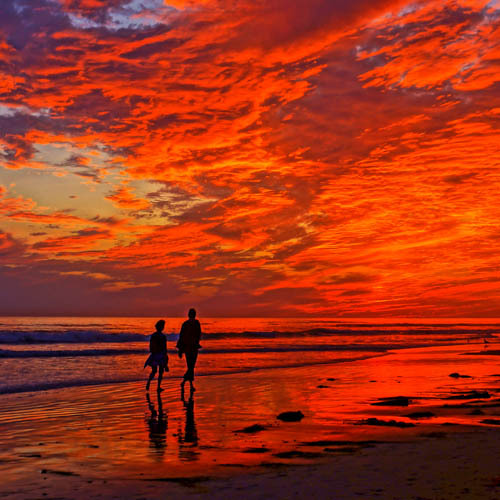 What we love about it: Santa Barbara is the perfect little getaway for a weekend of romance. If you’re looking for some time together to rest, rejuvenate, and rekindle the fire, Santa Barbara is the perfect place. What to do here: We love Arroyo Burro for a sunset walk, and with plenty of parking and restroom access it’s a stress-free beach walk experience. Water Quality: Arroyo Burro has great water quality in the summer or whenever it has been dry enough that the creek hasn’t breached. Make sure to heed any beach posting signs you may see if you’re feeling like taking a dip. But if the creek is flowing, be sure to stick to the sand over the waves. What we love about it: Another area that is just so beautiful, we can’t limit it to just one beach. 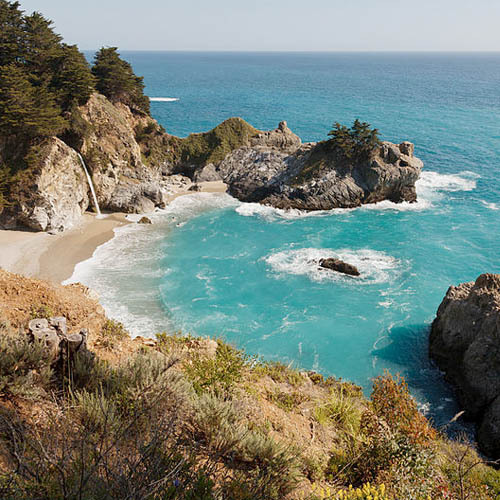 The shoreline in Big Sur is renowned for its rustic coastal beauty. A drive along the twisty coastline is certain to inspire awe. Pull off whenever your heart desires, and be sure to take photos so you can revisit the view whenever you like. What to do here: McWay Falls is a stunning spot where you can watch a perfect little waterfall pouring directly to the beach. The Bixby Canyon Bridge is another cult favorite, and there’s even a Death Cab for Cutie song to match. There are plenty of hiking trails, camping sites, and little cafes to warm up in. Water Quality: Monterey water quality testing only extends as far south as Carmel, so while there aren’t any sampling sites to rely on, the area is un-urbanized and thus less likely to have bacterial problems. What we love about it: If you’re in the Bay Area and looking for an ideal view of the Golden Gate Bridge, this is our favorite sandy spot. What to do here: The dramatic backdrop makes this spot ideal for a photo shoot, or even just a quick selfie-sesh. We’d recommend cuddling up for a romantic picnic and enjoying the sunset together. Water Quality: Just be sure to avoid swimming near the creek outlet if you’re looking to take a penguin dip. 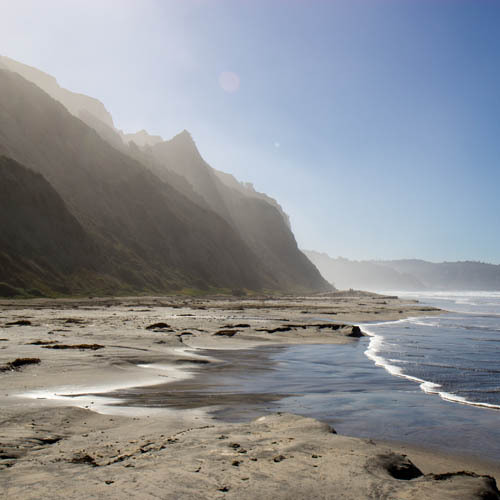 What we love about it: The farther north you go in California, often the more dramatic and rural the coastal landscape. This National Seashore is a prime example of that raw beauty, and it is sure to take your breath away. What to do here: There a quite a few campgrounds and hiking trails within the area if you’re looking to get back in touch with nature. Water Quality: Marin County no longer samples within this area. The closest active sampling station is Bolinas Beach (another beautiful spot), just south of Point Reyes. Heal the Bay’s Beach Report Card is the only comprehensive analysis of coastline water quality in California. We monitor more than 500 beaches weekly from Oregon to the Mexico border, assigning an A to F grade based on the health risks of swimming or surfing at that location. How's the Water Quality at West Coast Beaches This Summer? Just in time for the last hurrah of summer, beachgoers on the West Coast can head to the shore this Labor Day secure that they’ll be swimming and playing in healthy water. According to the 2013 End of Summer Beach Report Card®, beach water quality in California, Oregon and Washington was excellent for the fourth consecutive summer. We collected water quality data at more than 640 monitoring locations along the West Coast between Memorial Day and Aug. 21, 2013. Then we assigned an A-to-F grade based on bacterial pollution levels. Nearly 96% of California beaches earned an A or B grade. Washington earned A or B grades at 91% of its beaches, and Oregon earned all A grades for the fourth consecutive year. Beachgoers can find out which beaches are safe, check recent water quality history and look up details on beach closures using our Beach Report Card. On the go? Download a free Beach Report Card mobile app for iPhone or Android. How shady is the water quality at your beach? APP UPDATE: We are currently experiencing some issues with the Beach Report Card App due to opperating system changes. In the meantime, please go directly to beachreportcard.org for all your healthy beach reporting needs! Is the water quality at your favorite California beach shady? 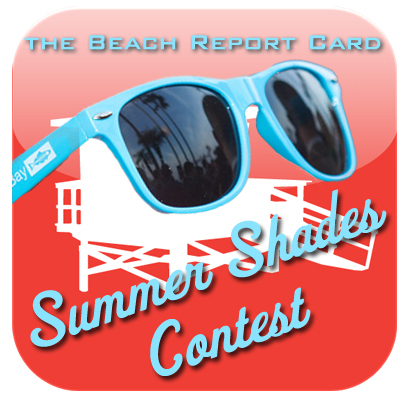 Find out in the Beach Report Card (BRC) Summer Shades Contest! Watch the water quality at your favorite beach and you could win an exclusive pair of Heal the Bay shades. We’re giving away ten pairs of our limited edition “I Heal the Bay” sunglasses over the next ten days. Every day, starting Tuesday August 6th, we will pick a winner and announce them on Facebook, Twitter and Instagram. To win a pair of shades, be the first to answer the daily trivia question found on our Facebook page. To enter, download the Beach Report Card mobile app and leave your answer as a comment in the feedback tab including the hashtag #SummerShades. In honor of the first Swimmable California Day, a few of us at Heal the Bay felt inspired to share our favorite beaches for swimming, surfing and kayaking because today we celebrate California’s healthy waters and the legislation we’ve enacted to protect them. Now go get in the ocean! Slicing through the emerald green saltwater with my kayak paddle, I enjoy the expansive view of Catalina’s craggy island coastline. If I look closely, I might spot a grazing bison on the hills or a soaring bald eagle searching for fish. I beach my kayak along the narrow isthmus beach and head up towards the small SCUBA shop to check if my tanks are filled from this morning’s dives. I treasure my summer weeks at Catalina Island, diving right off our sailboat to be submerged within an underwater world filled with garibaldis, bat rays, and giant kelpfish. No sounds of cars, crowds, or sirens – just the ocean breathing, people laughing, and boats cutting through the water. Catalina Island’s isthmus is my favorite swimmable beach, and my little ocean paradise. Some people seem a little shocked when they ask my favorite place to surf, and hear my response, “Malibu.” Malibu, Surfrider, 1st Point are all names for the long peeling right break just north of the Malibu Pier (pictured right). And, despite its water quality problems, it is my favorite wave, which I feel a little shame admitting as a scientist at Heal the Bay. During dry weather, Surfrider can score A’s on our Beach Report Card®, but during rainy weather or when Malibu Lagoon breaches, it’s not surprising to see it score F’s. Even with the crowds, I can’t get enough of the glassy long ride, whether it’s knee surf or overhead. It’s too bad the questionable water quality haunts the minds of most surfers at Malibu, which is why California Swimmable Day is important – it reminds us that all beaches should be safe for swimming, and that clean-up efforts at dirty beaches need to be implemented to meet this goal. Sometimes it’s hard to stay out of the surf after a rain, especially with a nice storm swell, but the risk versus reward has to be weighed. Some of my favorite spots near Malibu include: the veggie Farm Sandwich at John’s Garden, the refreshing smoothies at The Vitamin Barn, nighttime grunion runs on the beach during the spring and summer, catching a quiet sunrise over the Bay, spotting surfing dolphins (a rare but rewarding moment). I love summer time in SoCal for so many reasons. One of my favorite reasons is the longer days. More sun means more of a chance to swim before or after work. One of my favorite spots to swim is to the south of the Santa Monica Pier, right near Tower 18 (the second tower south of the Pier). It’s close enough for all the Pier amenities, and the long beach allows the waves to just roll in. On a Thursday night, I can watch the opening act for the Twilight Concert Series as I body surf or boogie board. With a backdrop of the sun setting behind the Santa Monica Mountains, those summer moments are hard to beat. Torrey Pines State Beach is my favorite beach to visit when I am in San Diego. Torrey Pines offers everything you need to have a great beach day-good waves year round, beautiful natural environment, plentiful parking, and Mexican food within walking distance! I love to surf and Torrey Pines always has waves. I have been surfing here since I was a kid and whenever I am in San Diego, I try to surf Torrey Pines at least once because it reminds me of my childhood and I always seem to feel better off when I leave. On Saturday, July 27, 2013 LA Waterkeeper will host two events to celebrate! Bring your family for a fun day in the water! 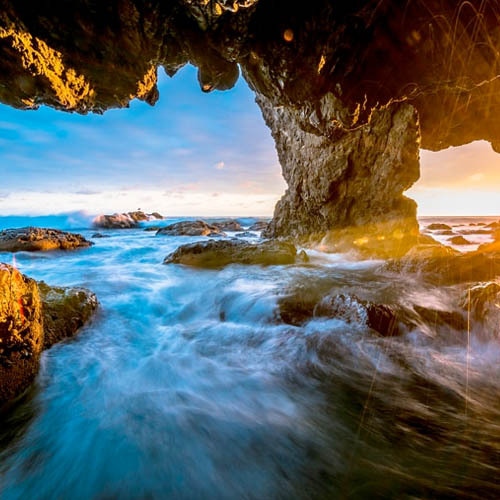 Enter the California Coastalkeeper Alliance photo contest by uploading your favorite ocean action photos on Facebook, Twitter and Instagram with #SwimmableCA. CCKA will announce a grand prize winner on August 1, as well as top swimmable pet and youngster entries, and wettest photo. Free Bird! You might be grateful to hear your favorite band cover this song…or not. At Heal the Bay, we can say without irony that we are grateful to Freebirds in Agoura Hills for teaming with us to restore the Malibu Creek Watershed in January. Not only did a group of Freebirders join us, but they surprised us and brought burritos! It was an awesome day, pulling weeds, planting mulefat, eating burritos. Thank you, Freebirds! A big thanks to the Gesso Foundation for their longtime support of our Key to the Sea program. Due in large part to their generosity, we’ve successfully provided thousands of Los Angeles County-based students and their teachers (K-5th grade) with high-impact environmental education and memorable field trip experiences. For many of these students, participation in the program marked their first chance to explore the beach environment and witness marine life up close! The Gesso Foundation was created in accordance with the wishes expressed in the will of acclaimed artist Frank Moore, who died in 2002. The Foundation’s purpose is twofold: to preserve, protect, and expand awareness of Frank Moore’s art; and to support non-profit organizations devoted to the arts, social justice, environmental or AIDS-related causes. Much like Mary Poppins herself, moms rely on Mommy Poppins LA, consulting the site for non-boring, low-cost activities to do with kids. Meanwhile Heal the Bay and our Aquarium couldn’t spread the word about our kid-friendly, fun AND educational happenings without their help. As parents and as youth educators, we thank the staff at Mommy Poppins LA for being such a helpful resource. Do you devote your free time to volunteer with Heal the Bay? Then it’s time for us to thank YOU. Please join us on February 19 at Bodega Wine Bar as we celebrate you and all that you do to help protect our Bay…and beyond. Join us to help revive Malibu Creek by removing weeds and planting natives on February 10. Do you care about clean water in your community? Love putting on a show? Want to make change (not just the money kind)? Join our elite Speakers Bureau team to help raise educational awareness across Los Angeles in schools, workplaces and social groups. For more than 25 years, Heal the Bay has relied upon people just like you to help spread the word about ocean pollution. Last year we were able to reach 55,000 people! Obviously, we can’t do this on our own: We need you! Our winter training sessions begin on Tuesday, March 5, 1-4:30 p.m. at the Los Angeles River Center. Sessions run through the month on Tuesdays in March (the 12th and the 19th), with a talk on Saturday, March 16, 9:30 a.m.-noon at Venice Pier. Attendance at all sessions is mandatory. Register for Winter Speakers Bureau Training. As representatives of Heal the Bay, we often get asked: “Is the bay healed yet?” People know we’ve been at this a long time (more than 25 years). While the answer is a qualified “yes,” we still work every day to fulfill our mission to make southern California’s coastal waters and watersheds, including Santa Monica Bay safe, healthy and clean. Our tools? Science, education, community action and advocacy. Each year we discuss where we’ve been, where we’re headed and how we’re going to get there. It’s a valuable process requiring that we all know what our HtB colleagues are up to: whether we’re teaching school kids at our Aquarium, coordinating our next advocacy campaign or analyzing water samples in Malibu Creek. In 2013, we plan to continue to build our MPA Watch program. We will review data collected by MPA Watch volunteers and interns, and share it with management, enforcement, and other monitoring agencies to help understand and evaluate how local Marine Protected Areas (MPAs) are being used. We also plan to inform and evaluate the development of fisheries management plans for key southern California fisheries, including spiny lobster. Additionally, in 2013, we will work with local and statewide partners to advance the statewide sustainable seafood policy developed by the Ocean Protection Council (with Heal the Bay’s involvement) and local efforts to promote sustainable seafood. On the education front, we are playing a leadership role in creating new MPA curriculum for teachers with the Southern California Aquarium Collaborative. Heal the Bay will continue to develop our Stream Team program. We plan to begin evaluating watershed impacts associated with agricultural development in the Santa Monica Mountains, including vineyards. Additionally, we hope to inspire residents and recreationists in the watershed to become Creek Stewards, and help scout for watershed health impacts throughout these mountains. We will educate local partner groups and management agencies about the findings of Heal the Bay’s State of the Malibu Creek Watershed report. We will also work with watershed partners and policymakers to prioritize and implement recommendations detailed in the report aimed at improving local stream and watershed health. Heal the Bay will continue our partnership with Stanford University in developing a predictive beach water quality models. The models will use oceanic and atmospheric factors (i.e. tides, waves, temperature, wind direction etc.) as inputs to forecast indicator bacteria concentrations at beaches, as means of providing early “nowcast” warnings of human health risks (our current methods take 18-24 hours to process, leaving the public with day-old water quality information). 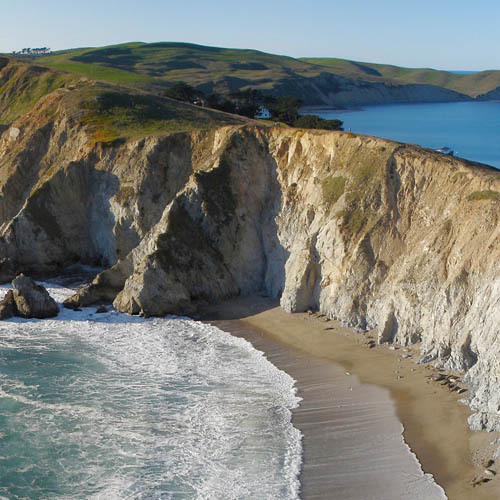 We plan to develop simple models for 25 different California beaches that will rapidly “predict” when beaches are in or out of compliance with water quality standards. Additionally, these models will be helpful in identifying and prioritizing beach cleanup and abatement priorities. To take student learning beyond the classroom into community action and civic engagement, Heal the Bay will organize more youth summits. Students learn how to protect what they love through adjusting their own behavior, speaking publicly to businesses and governments and educating others in their local communities. This year we will focus on scheduling these events quarterly, formalizing their structure, and expanding their reach throughout Los Angeles County high schools. Heal the Bay will expand our teacher education and professional development opportunities in 2013. New workshops and field experiences will be offered to help increase teacher expertise in teaching environmental principles and concepts, marine and watershed science knowledge, and best practices for melding field and laboratory activities into their own classroom curricula. To further educate the 75,000-80,000 annual visitors to the Aquarium about water conservation, we plan to overhaul the Green Room, named after Heal the Bay’s founding president Dorothy Green, with a new exhibit in her honor. The education room will include interactive, bilingual exhibits on watershed education and the urban water cycle, as well as a space dedicated to Dorothy’s accomplishments and inspirational vision. In 2013, we’ll expand our environmental education outreach to more low-income communities and to a wider range of age groups. Through our partnership with the Discovery by Nature program, we’ll be able to reach classrooms in underserved communities, where public education in the sciences — as well as field trip funding — are limited. In the new year, Heal the Bay will mobilize support for the Clean Waters, Clean Beaches funding measure, which will drive an extensive and multi-faceted water quality clean up and conservation program in Los Angeles County. The proposed measure would address contaminated drinking water, polluted stormwater runoff as well as toxins and trash in the Los Angeles and San Gabriel rivers, among other challenges. In 2013, we will take a leadership role in advocating for a strong single-use bag ordinance for the City of Los Angeles that is consistent with several other policies adopted by local governments in the area. We will work with partner groups and City Council offices to conduct outreach to the community about the pending ordinance, and ensure that a final policy is adopted that eliminates single-use plastic bag usage in the City at grocery stores, pharmacies, and convenience stores, and greatly reduces paper bag distribution from these locations. In 2013, Heal the Bay plans to run all Nothin’ But Sand monthly beach cleanups as Zero Waste events. Building upon the success of the 2012 Zero Waste cleanups in October and November, we shall focus this year on not generating excessive waste in the process of performing large-scale public volunteer events. The hope is that the public will witness our commitment to practicing what we advocate, by going reusable and minimizing trash. Heal the Bay, in partnership with the U.S. Army Corps of Engineers and the Goldhirsh Foundation, will complete a project to build trash capture devices in the concrete portion of Compton Creek, just upstream of the earthen-bottom, riparian section. Compton Creek is the last major tributary that feeds into the Los Angeles River before it ultimately reaches the ocean in Long Beach. The devices ‑- adjustable metal racks that will be bolted into the channel bottom — will capture trash from dry weather urban runoff and low volume producing storm events and go a long way toward improving water quality. A Park in South L.A. Heal the Bay is partnering with Wisdom Academy for Young Scientists (WAYS) Charter School to complete the construction of the WAYS Reading & Fitness Park on the site of 4,000-square feet of unused City land in 2013. This park, located at the intersection of McKinley Avenue and 87th Street in South Los Angeles, will be on the leading edge of green technology, recycling street water to irrigate its own landscape. Help us reach our goals this year, donate now and keep the field trips, advocacy campaigns and water testing afloat! Read more about Heal the Bay and how we work to fulfill our mission. This trashcan tells quite a tale, discovered more than 2,500 miles away from our Santa Monica base on a Hawaiian beach. Researchers found the intact plastic trashcan emblazoned with Heal the Bay stickers while they were surveying 2011 Japanese tsunami debris at Ki’i Dunes on Oahu. “It really highlights the fact that trash travels very far,” Nicholas Mallos, a conservation biologist and ocean debris specialist at the nonprofit Ocean Conservancy told LiveScience. Mallos and colleagues from the Japan Environmental Action Network, the Oceanic Wildlife Survey and the Japan Ministry of the Environment just completed the beach survey in Hawaii in search of tsunami debris. The Hawaii survey turned up masses of typical ocean garbage, including fishing nets and traps, Mallos said, noting the irony of also finding a “Heal the Bay” trashcan. The problem of typical ocean trash is inextricably linked to the issue of tsunami debris, Mallos continued. Tsunamis aren’t preventable, but regular ocean litter is, he said. Apparently even trashcans can become part of the problem. You can help reduce the problem of plastic in our oceans by ditching one-time use plastics and going reusable instead, from grocery bags to coffee mugs and water bottles. 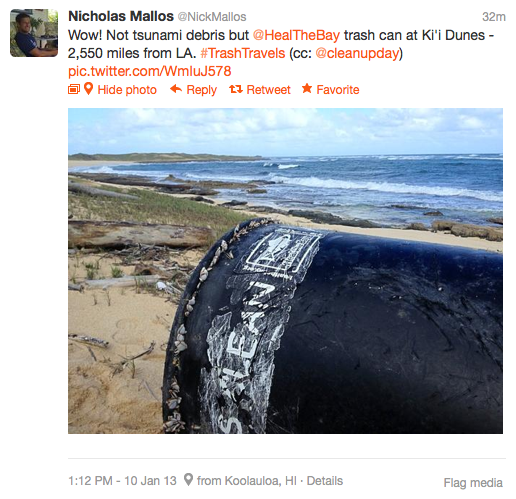 UPDATE 1.22.13: A Hawaiian Islands Land Trust employee reported today that another Heal the Bay trashcan has washed up in the Aloha state; this time along the shoreline of Maui’s Waihee Refuge. 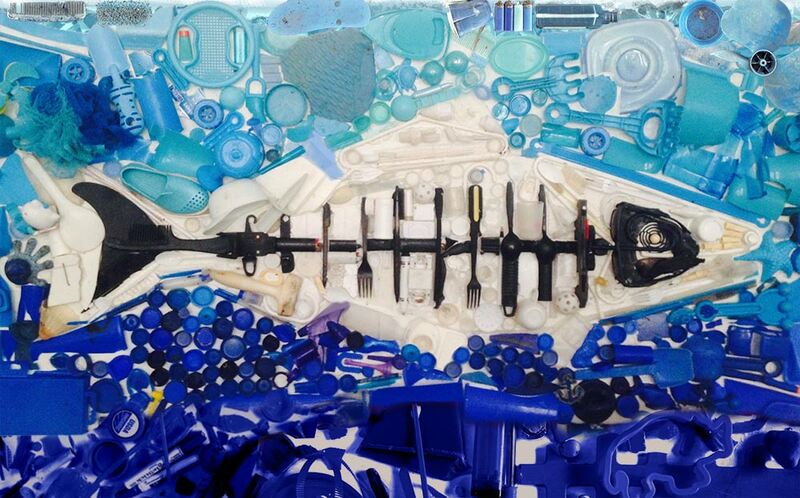 Read more about plastic marine debris. Become part of the plastic pollution solution: Join a cleanup effort, our Speakers Bureau or the many other ways we offer to get involved. Planting one of the first MPA signs along Los Angeles’ coast felt like it’d been a long time coming. California lays claim to the only statewide network of Marine Protected Areas (MPAs), or underwater parks, where ocean wildlife can thrive with less disturbance from humans. Yesterday our Coastal Resources Director Sarah Sikich and I, along with our colleagues at L.A. Waterkeeper, installed the first MPA signs in Los Angeles County along access points in Malibu’s marine reserve. Southern California’s marine protected areas have been in effect for a year — after years of hard work to implement them– and now they’ll finally be marked. Point Dume State Marine Reserve is located on the Malibu Coast, and includes a rocky headland peninsula, one of the world’s most popular coastal destinations. Migrating gray whales often stop off and feed along Point Dume, and the reserve’s kelp forests, canyon, and tide pools teem with octopus, anemones, and sea stars. Historically, Point Dume’s kelp forest has been the largest in southern California, providing food and shelter for a variety of sea life, including sea lions, grunion, and spawning squid. It took over a year to get these initial simple signs designed, approved, funded, and installed- but an even longer public process to identify, negotiate, and designate MPAs along the Southern California Coast. Big thanks to the collaborative efforts of the California Department of Fish and Wildlife, Natural Resources Defense Council, and Los Angeles Waterkeeper for helping to make these signs become a reality! Next up are installing MPA signs along the Palos Verdes coast and Catalina Island … and later on this year, beautiful and informative MPA interpretive signage which will include images, maps, and multi-lingual descriptions of our local MPAs. For Heal the Bay, this is just the first step in education signage, but an exciting one to help with marine protected area education. For ocean lovers who want to get more involved with underwater parks, join our MPA Watch training program on January 30 and February 2 to help monitor these vital environmental resources. Through a powerful collaboration between Holocaust survivors and teen filmmakers, Heal the Bay received a video gift that will definitely keep on giving. Students produced It’s Not Just One, a public service announcement that vividly depicts the impact of littering on the health of our communities and ocean. The PSA was created in a “Righteous Conversations Project” workshop held over the summer at Harvard-Westlake school aimed at students in 7th-11th grades from all over L.A. These teens worked with Holocaust survivors to pinpoint injustices they wanted to confront together. Through the workshop they learned to harness the power of media messages, the ways video can be used to raise awareness and effect change. 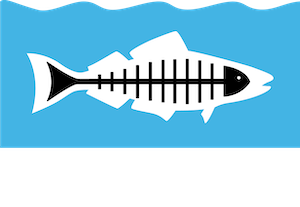 Once the student filmmakers (Sarah McAllister, Kelly Morrison, Kyra Perez and Jordan Seibel) completed the PSA, they decided to gift it to Heal the Bay, which pleased Idele, a longtime supporter of Heal the Bay’s work. With her husband Ben, Idele spent years volunteering at what is now Heal the Bay’s Santa Monica Pier Aquarium. “I thought It’s Not Just One was incredible. The result is so powerful,” she said. Righteous Conversations launched in 2011 and is a project of Remember Us. Harvard-Westlake’s Visual Arts and Film Chair Cheri Gaulke led the workshops. Learn more about participating in the Righteous Conversation workshops. Watch Heal the Bay’s videos, from mockumentaries to hip hop music videos and silent films.